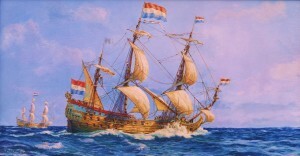 Dutch Eighty gun Ship of the Line, full size replica. A tale of two paintings. The original ship was built in an astonishing 6 months from keel laid to setting sail fully equipped and laden. The Zeven Provinciën sailed into history as a favorite, fast flagship, she saw action many times mostly against the English. To claim your rare copy please go directly via this link to our Payment page . Oostvaardersdijk P.O. Box 119, 8200 AC Lelystad, the Netherlands. The objective of the project at the Batavia Werf, Lelystad is the core of a youth job training program and center piece for the marine park and museums. As such it is very successful attracting hundreds of thousands of visitors. ‘Zeven Provinciën’ Project, an idea transferable to Harwich, is in part tourist attraction, has revitalised the town of Lelystad (as ‘Hermione’ did for Rochefort sur mer) and importantly is used to revitalise unemployable youths, teaching real work skills, team work, self respect and many other qualities. 80 % of the youths, kids who would not get up in the morning, go on to find jobs or higher education. I feel honoured to have supported such a project. The Batavia Wherf (Yard), which had already built the fine replica ‘Batavia‘ . Because of the ship’s Australian connections they agreed to send their Batavia to Australia to take part in the Sydney celebrations around the 2000 Olympic Games. Unfortunately there was a problem returning Batavia to the Netherlands so the yard was forced to ceased trading for some years apparently due to financial difficulties caused by sponsors in Australia not honoring agreements. Making drawings on location of the hull of the new De Zeven Provinciën Gordon Frickers could not believe the measurements & shape appearing on his sketch pad. As a Cornish trained boat builder himself, he just had to raise this with the master ship right, Willum Voss. Willum (now retired) is as you would guess, a very well read, very experienced gentleman, steeped in traditional ways, yet very alive to contemporary demands. His reply gave me a sense of hearing something very ancient. I quote directly from Gordon Frickers sketch book notes, Willum said, ” In Holland we make ships’ like a parabola, always for more cargo“. “Old books from the 17 m century say don’t make the ship to full at the bow. Always a problem. Hence shape of the front when seen from above on draft“. As built this hull is sharper than the half model, a deliberate decision by Willum. He said “Bow & stern are always based on an arc of a circle, 85% of the beam for the bow 75 % of the maximum beam for the stern. Do it by your own,” he said, “always you see you have a good ship“. “For sheer, when you make the ship by eye, you make a point fore & aft. Hang a rope down the center line. Take points & mark off to beam with a spirit level. At bow & stern run the line around the circles previously established It looks round on paper but sharper in life“. 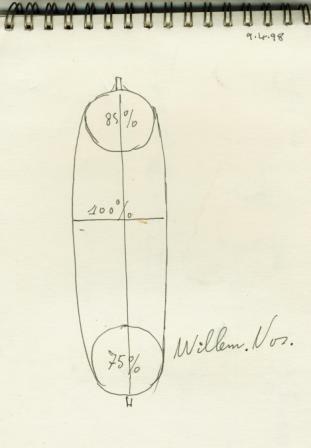 Willum produced the sketch shown here to illustrate his point. 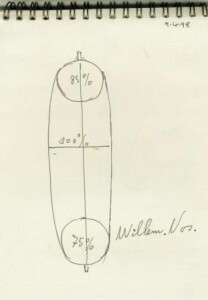 Sketch by Willum Voss, master ship wright. 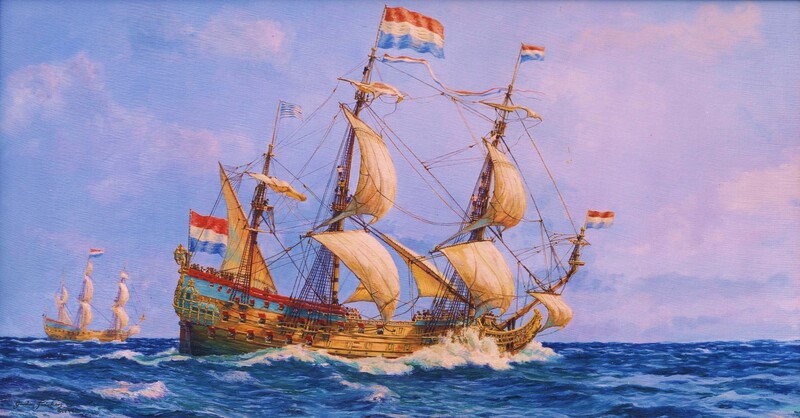 The reasons behind this distinctive Dutch design can be found in the home waters Dutch ships operated in; mostly shoal water inclined to produce short steep seas . I was commissioned to produce 2 paintings of De Zeven Provinciën for Henk van der Hoef. Mr.van der Hoef, a natural professional sea man, port and canal builder took the artist to the yard in the Netherlands. Our plan was to produce prints the sale to support this amazing project. The Batavia Yard was founded in 1985 by master shipbuilder Willem Voss. It is foremost, a center for traditional ship and boat building, a training center were young people, exclusively drop outs who won’t get up in the morning, learn to work in an enthusiastic team, learn traditional skills, to use modern tools too, regain self confidence a& self respect. I was delighted to be invited to support this project. By 2003 three million people have visited the yard in Lelystad in order to gaze in admiration at the craftsmanship. Having completing the Batavia, the yard started its second major project as ambitious as the first one. On 17 May 1995 a start was made with De Zeven Provinciën (i.e. ‘Seven Provinces’). The building of this big 17th century warship is expected to take at least 15 years. Incidentally the very successful French Frigate Hermione took 18 years to complete and in the process revitalized the town of Rochefort sur Mer. With the building of the new De Zeven Provinciën, the yard has taken a step forward in experimenting with the traditional techniques of the 17th century. 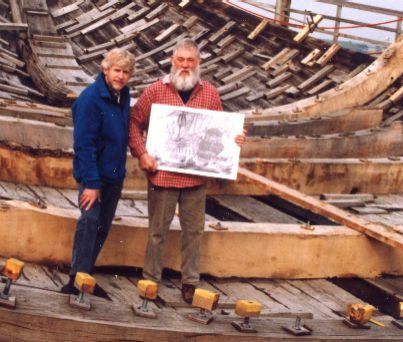 Willum Voss said, the hull is built the old Dutch way, from the bottom up, not keel & frames first. A method which has roots beyond that go deeper than the dark ages. The system was within a 100 years of the Zeven Provinciën building ousted in favor of the ‘English’ method’ of building planks onto frames. 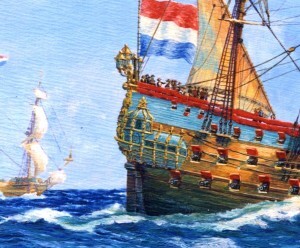 This ancient `Dutch method is closer to Viking techniques than those used to build Nelson’s “Victory“. The famous Tudor flagship “Mary Rose” was probably built this way. Through out the 17th century in the Netherlands it was the Shipwright who decided how a ship was designed & built, not the commissioner. Specifications were written, plans & models followed not preceded the building. One of the first problems was to find suitable timber in sufficient quantities. Soft wood was found in the Black Forest & eventually oak, in Denmark. After the oak started to arrive it was discovered to be from a forest originally planted 250 years earlier for ship building – by the Dutch East India Company! In 1665, ” De Zevern Provinciën” represented the cutting edge of Netherlands design being larger & more powerful than the rest of her fleet. In December 1664 the keel was laid in the admiralty yard in Rotterdam of a new ship whose object it was to serve as the ‘Admiralty ship’ as a result of the commercial rivalry between English and Dutch merchants that led to the Anglo-Dutch War of 1652-54 reemerged in the early 1660’s. In anticipation of renewed hostilities, the Dutch undertook a major building program; one of the largest vessels launched was the De Zeven Provinciën. The construction was part of a large fleet building programme which aimed to intensify the country’s maritime strength against England. Intended from the out set to be very special, a flagship. She was originally built for the Board of Admiralty of Rotterdam in 1664-1665. The original Zeven Provinciën was built in six months, keel laid to making sail. An achievement that demonstrates the skills and clever organisation of Dutch ship wrights of that period. The name Zeven Provinciën has been used 6 times by the Netherlands Navy including on a contemporary frigate. With this new picture, based on extensive research the first and most famous Zeven Provinciën, and have included some of her history, for your pleasure, with links. The ship was 163 feet long from stem to stern, 43 feet wide. She sailed out the following August, a feat which speaks volumes for the organization, skill & efficiency of her builders. This placed her in the period of the Oliver Cromwell, King Charles the second & the Anglo Dutch wars, an age when Dutch maritime power was at its zenith. De Zeven Provinciën was considered unusually fast – which more than a few times saved her from her enemies. She fought the English repeatedly during the Anglo Dutch wars, being involved at all the major actions including the Four Days battle & the raid on the Medway & Thames. In 1674 she was part of the fleet that, via the Canary Isles, attacked Martinique. 1678 saw her allied to the English & operating off the coasts of Spain including into the Mediterranean. “Zeven Provinciën” was repaired at Portsmouth in 1692. The English wrote they considered her a very fine traditional Dutch ship. Her own people were immensely proud of her. 1665 was the year the Netherlands Marine Corp was formed so she would have been one of the first ships to carry these new, specialist troops. Dutch ships of the period were quite distinct from French, English or Spanish. Most notably, they were, in a very ostentatious age, less ornate. Other features instantly distinctive to a sailor included more beam to length ratio, a full round bow, relatively shallow draft. The site she was built at was regrettably destroyed by the murderous Nazi blitz in 1940 on Rotterdam. She was very ‘high tech’ for her time, De Zeven Provinciën sported all the latest ideas including very early versions of stunsails, & reefing points. Safety aloft was still a matter of individual skill & luck, sailors did not ‘clip on’ & the security of foot ropes waited for a future generation to invent. Her upper decks were fitted with canvas awnings to protect her crew from the elements & conceal them in battle. Her coat of arms was two red lions either side of a central gold on blue surrounded by a coats of arms of the De Zeven Provinciën – of seven provinces. The lowest coat of arms was of the Rotterdam Admiralty. Paint work was a greenish blue (turquoise) with carving painted in imitation of gold. The new replica is well worth a visit & even incomplete will is some thing very special. The Royal Netherlands Navy continues to use the name Zeven Provinciën. A new ship, a frigate, is the first unit of the class (De Zeven Provinciën) launched 08 April 2000. Royal Schelde have built four De Zeven Provinciën Class guided missile carrying fast frigates for the Royal Netherlands Navy. The Air Defence and Command (LCF) version frigates were built at the Royal Schelde’s Flushing shipyard. For further reading see Ships of the World: An Historical Encyclopedia – Zeven Provinciën. See also “The Four Days Battle”.